Free to any student in North Carolina, Financial Basics explores key money management topics you can use right now. High school students receive a series of short courses that are mapped to NC financial literacy standards. College students receive a single comprehensive course. All eligible students are entered to win one of our annual financial literacy scholarships. Financial Basics can be used in conjunction with teacher-led curricula, as part of a college orientation program, or as an independent study resource. Classroom-based teacher tools make it easy for teachers to assign financial education lessons and to track student progress. College tools give administrators the ability to track participation across an entire campus. 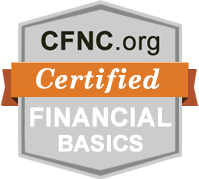 High school students can earn state-recognized financial literacy certification by completing the Financial Basics curriculum. Once certified, you'll earn a badge that can be shared with employers, schools, social media contacts, plus more. You'll also get a personalized page that shows what you've learned and explains each achievement in detail. Whatever your academic or employment goals, personal financial management is an important life skill that you can always improve. Learn more about the curriculum or register now to set up your first Classroom. Use a student's completion code to verify completion of Financial Basics. Request a password reset and get quick answers for common questions.